Garroni Design & Michael Peters. Her accommodation includes a good sized master and further twin and the saloon table also converts to another double berth. The galley includes everything you will need including a microwave cooker. The deck space is very generous with a large table, sun pads aft and forward and she even has a garage. one of the main features is the oversized electric sliding sunroof that turns this HT into a true open! She has ample power from the twin Cummins 320hp diesels. She has the axus prop systeme which includes joystick and is a very confortable and pleasant option! 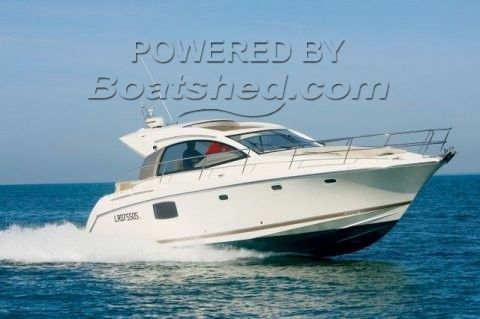 This Jeanneau Prestige 38S has been personally photographed and viewed by Antoine Perrin Daragon of Boatshed Riviera. Click here for contact details.